From the Auxerre region to the north and the Beaujolais hills in the south, Greater Bourgogne offers a vast diversity of terroirs, memories and tastes! Our territory benefits from exceptional geographical conditions, but it doesn’t end there…we have a climate that favours winegrowing, distinctive geology, outstanding grape varieties and incomparable soils – all of which contribute to the creation of internationally celebrated wines. And we mustn’t overlook the know-how, handed down from generation to generation, of our winegrowers. Naturally, all wines from La Burgondie are born from the work of our cooperative winegrowers. On every back label of wines from La Burgondie there is a Flashcode which, after scanning, gives direct access to information about the wine concerned. This is not a generic information page - but a mine of information for those who wish to learn more. Bourgogne wines make up four main categories. They are, in increasing order of rarity: the Regional Appellations, Communal Appellations, Premier Crus and Grand Crus. Regional Appellations account for more than half of Bourgogne’s viticutural output and are produced from the whole of the region’s vineyards, or one of its sub-categories. A bouquet of citrus notes, white-fleshed fruits and white flowers (acacia). Supple, fruity and fresh, it is very appealing in the mouth. A bouquet of citrus, white-fleshed fruit (pear), stone-fruit (fuzzy peach) and white flowers (hawthorn). Floral and fruity, it is full and juicy in the mouth with a lively finish. Pale golden colour with silver glints. A citrus bouquet with notes of white-fleshed fruits (pear, peach). It is aromatic and refreshing thanks to its acidulated nature and the saline finish. Pale golden colour, limpid, with silver glints. A bouquet of flowers (acacia), citrus, and white-fleshed fruit (pear). It is straightforward, rich and cheery in the mouth with an intense mineral finish. A bouquet of citrus, flowers and white-fleshed fruits along with hints of almonds. Finely-cut and appealing, it is refreshing in the mouth with an elegant finish. Brilliant gold colour with green glints. Fresh and intense bouquet featuring aromas of stone-fruit (peach, apricot) and nuts (almond, hazelnut). Lively in the mouth with subtle, vinous texture. Well balanced thanks to its natural refreshing quality. Rrilliant red colour with ruby glints. Intense bouquet of red and black fruit berries (blackberry, blackcurrant, redcurrant). Straightforward, juicy and loaded with red fruit. It has a supple and nicely layered texture with nuances of soft spices.ody. Ruby red colour with purple glints. Aromas of ripe red and black fruit berries (raspberries, cherries, blackberries) alongside notes of plums. A supple and appealing red wine, it is full of crunchy fruit with lots of body. Limpid red colour with ruby glints. Both juicy and appealing, it exhales aromas of kirsch and red berries (Morello cherry, bilberry). Rich, rounded and well-balanced thanks to fine, soft tannins. Aromas of red and black fruit berries (bilberries, cherries, blackberries, strawberries). Structured and silky, it is supple in the mouth with soft tannins. Aromas of ripe red and black fruit mingle with animal notes and smoky, forest floor nuances. Silky and structured, it gives flavours of violets in the mouth along with soft tannins. Brilliant red colour with ruby glints. Fine and fruity bouquet with intense red fruit aromas (strawberry, raspberry, cherry). Fresh, juicy, airy and appealing in the mouth with soft, elegant tannins. Retro-olfaction gives notes of very ripe red fruit. Limpid red colour with grenadine-purple glints. Fresh, focused bouquet of red berries (wild strawberry, raspberry, redcurrant). Ample and profound with suave tannins, giving an attractive and pleasing arrangement. Retro-olfaction gives floral notes (peony) and spice (white pepper). Brilliant red colour with purple glints. Elegant and intense bouquet featuring aromas of red fruit (strawberry, cherry). Rich, full and vinous, it reveals delicate favours of flowers (violet) and liquorice. There are silky tannins in the texture. Communal Appellations, also known as Village Appellations, are surprisingly uncommon in Bourgogne! They are, in fact, terroirs located in one or more communes where the right conditions for quality wine production are found. Such vineyards are commonly situated at the extreme upper and lower parts of the slopes within the different “Côtes”. Light golden colour with silvery glints. Notes of citrus (grapefruit, mandarin) and exotic fruits (litchi, mango) blend with broom flower and boxwood. Tense in the mouth and thirst-quenching with an acidulated finish. Pale gold with green glints. Notes of white-fleshed fruits (pear, apple) and citrus along with lime tree flowers and spice. Both rich and mineral in the mouth with a nicely saline finish. Golden colour with green glints. A bouquet of white flowers (acacia, honeysuckle) alongside white and yellow-fleshed fruit. Straightforward and refreshing in the mouth with a honeyed finish. A bouquet of white flowers (acacia, hawthorn) along with notes of almonds and spice (cinnamon, pepper). Flavourful, elegant and well-structured in the mouth with a fine finish. Aromas of white and yellow-fleshed fruit with nuances of lemon. Straightforward and well-balanced with a mineral finish. Pale gold colouring with silvery-green glints. A bouquet with both floral (acacia, lily of the valley) and fruity notes (pear, white peach, fresh grapes). Rich, refreshing and mineral in the mouth, it has a very fine finish. Limpid yellow colour with golden glints. Delicate and straightforward bouquet with fruity aromas (lemon, passion fruit) and mineral notes. It is generous and precise in the mouth with clean-cut citrus and white-fleshed fruit flavours. Refreshing saline finish. Notes of black fruits, flowers and spice. Well-structured and velvety in the mouth with lots of freshness. Aromas of red and black fruits with a hint of pepper. It is dense yet elegant in the mouth with silky tannins. Intense aromas of red and black berries (raspberries, redcurrants, blackberries) with notes of forest floor, violets and spice. Well-structured and appealing in the mouth with soft tannins and a fine finish. Aromas of red and black fruits with a hint of liquorice. Structured and powerful in the mouth, it is elegant with silky tannins. Limpid red colour with garnet glints. Intense appealing bouquet with aromas of red and black berries (blackberry, redcurrant, bilberry) alongside soft spices. Dense, silky and concentrated with fine tannins and a hint of pepper. Expressive, seductive bouquet with aromas of red and black fruit jam (redcurrant, blackcurrant). Limpid red colour with purple glints. A powerful pedigree bouquet with complex aromas of red fruit (Morello cherry, strawberry, myrtle) and spice (pepper, cinnamon). Suave and full in the mouth, it is a well-balanced wine with lively tannins. Retro-olfaction brings notes of ripe black berries (bilberry, blackcurrant). The finish is persuasive and subtle. Premier Crus are named localities (“Climats”) within the Communal Appellations, identified for distinctive characteristics giving better wines. 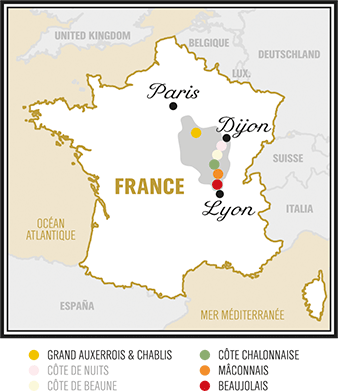 The name of the AOC is followed by the name of the locality classified as a Premier Cru. There are hundreds such Premier Cru Climats in all of Burgundy. These wines represent the jewels in the crown of our viticulture. Limpid golden colour with green glints. A bouquet of white flowers (honeysuckle, hawthorn, acacia), white-fleshed fruits (pear, peach) and hazelnuts. Well-structured and elegant in the mouth with good minerality. Pure and luminous pale gold. Aromas of pears, lemons, soft spices, hazelnuts and almonds. Complex mineral and iodine notes give finesse and elegance in the mouth with a remarkable finish. Luminous golden colouring with green glints. A bouquet of white flowers and ripe fruit with notes of hazelnuts and toasted almonds. Juicy, rich and appealing in the mouth with a fine mineral finish. Aromas of fruit and flowers with notes of almonds and candied quince. Straightforward, rich and structured in the mouth with a fine mineral finish. Rich, intense bouquet featuring acidulated aromas (lemon, exotic fruit, bergamot) and a mineral touch. Superb texture in the mouth with fresh, fine fleshiness alongside a fruit driven character (mango, lemon) as well as soft spice (star aniseed). The finish is saline and thirst-quenching. Aromas of red fruit with notes of undergrowth, coffee and cinnamon. Rich, juicy and concentrated and in the mouth with firm tannins. Intense, elegant bouquet that reveals aromas of ripe red and black berries (raspberry, bilberry, blackcurrant) along with soft spice, mocha and tobacco. In 1822, some wine merchants from Chalon-sur-Saône with vineyards in Rully and Mercurey invited a young winemaker from Champagne to their estates. This initiative resulted in the birth of sparkling white wine in Burgundy. In 1975, the appellation Crémant de Bourgogne welcomed stricter production conditions, traditional yet demanding know-how and high quality winemaking. This wine is only available as sparkling white (under the names Blanc de Blancs or Blanc de Noirs) or sparkling rosé and they are mostly “Brut”. Our winegrowers cultivate the vines for the production of Crémant (using mainly Pinot Noir and Chardonnay); the harvest is vinified in our wineries and then transformed into sparkling wine by Caves Bailly Lapierre - whose reputation is highly esteemed. Pale luminous golden colour with pink and silver glints. Notes of citrus and juicy orchard fruit (pears and apples). Lively, crisp and straightforward in the mouth, the finesse of the effervescence gives great freshness. Deep luminous golden colour festooned with fine bubbles. Notes of violets, red fruit (redcurrants, strawberries) and soft spice. Vinous and well-structured, it offers a combination of strength, balance and finesse. Notes of red fruit, forest fruit (wild strawberries, blackberries), dried fruit (apricots), biscuits and Viennese pastries. Finely-cut, thirst-quenching and aerial in the mouth with a superb finish. Notes of biscuit and ripe stone-fruit with a touch of white flowers and sweet almonds. Pure, profound and mineral in the mouth with remarkable length. Golden-pink colouring with light orange glints. Notes of rose petals, red fruit, biscuits, sweet almonds and cherry pips. Tender, subtle and aerial in the mouth with a finish that says “more !”.